Chronic pain can become a vicious cycle when it inhibits individuals from exercising and moving. Simple tasks, like getting out of the car, can be painful and discouraging. That’s why we’re empowering individuals with chronic pain through the M-Power program at MossRehab. 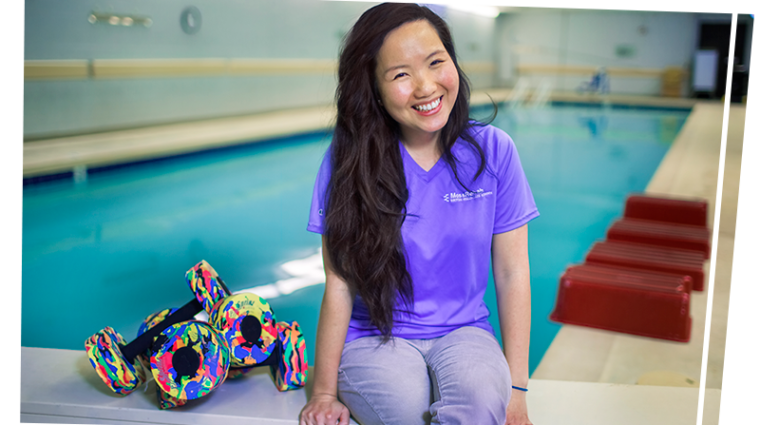 The Albert Einstein Society allowed us to purchase pool equipment, which we use in a class-like setting with physical therapy patients. We are giving people a place to go after their physical therapy to practice form and movement to a certain degree with reduced pain. Being able to exercise in the pool takes a lot of pressure off their joints so they can move more freely without experiencing pain and discomfort. By practicing these movements in the pool, our patients are improving their mobility on land and overall well being, and are able to do more with less pain. Vinh Trinh, BS, is an Exercise Physiologist at MossRehab Outpatient Center at Norristown.